What this research might lead to are ways to make submarines more “stealthy” i.e less detectable when the sub is submerged. Also I wouldn’t be surprised if this research produced quieter more stealthy submarine propellers. Another possibility is that the military already has done classified work in this area, and these researchers are rediscovering what the Navy already knows about. “So do you think that it is safe to assume that the lens of an eye could have first appeared just as a result of a completely random mutation and in fact was not a lens at all. For example it could be just a kind of a protection screen made of transparent cells which allow the light in but don’t allow in any ‘rubbish’? And after millions of iterations with natural selection applied this protection evolved to become a lens. It sounds reasonable. I’d point out that many creatures get by just fine with primitive light sensors that lack lenses. The animal that I have in mind is the garden slug. It possesses simple light sensors at the end of two stalks. More sophisticated light sensors would be of little use to a creature like this unless it also had a brain sophisticated enough to process the visual information, and a means of locomotion quick enough so that it could then act upon the information. Here is a short video I made showing the movements of a garden slug, illustrating the connection between its problem solving abilities, locomotion, and sensory equipment. The human mind is certainly remarkable in its ability to retain long term dormant memories. I've been reading the book "For the love of Physics" which is the autobiography of the physicist Walter Lewin. (cover shown at left) I've also been watching several videos of him delivering lectures on physics to undergraduate students at MIT. I majored in physics in college, so there was an element of faint recollection watching him explain the basic principles of mechanics, especially the motion of a pendulum. 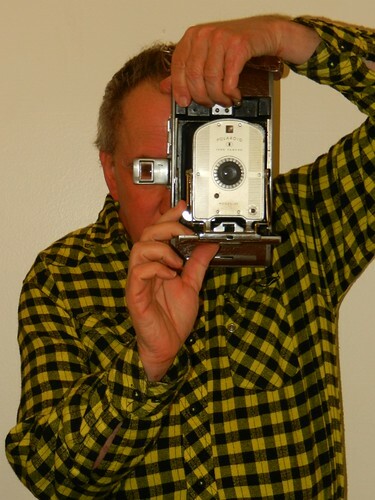 I recently purchased an old Polaroid camera at a thrift shop (see image at right). Fooling around with the camera brought back memories of a physics experiment that I did in college where I documented the movement of a double pendulum by making time lapse exposures with a Polaroid camera. What startled me was being able to recall this activity from 45 years ago that I had not thought about in 45 years! It's like this memory had remained dormant for 45 years, awaiting only the proper stimulus (reading Dr. Lewin’s book and fooling about with the camera) to return it to my conscious thinking. 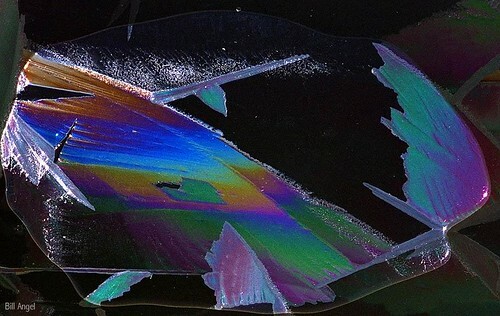 Visualizing “rainbows” in ice on the surface of a pond. I created a video that shows ants fighting. (above) It appears that a large number of ants from two different colonies were drawn together in combat on the sidewalk. One wonders how the ants sounded the alarm summoning their colleagues into combat? Also, I noticed that the ants kept touching each other with their antennae while they fought. What were they sensing?